I wanted to build a small, highly mobile sound cart for corporate and ENG jobs where having a platform to mix on would be nice, but the situation really doesn't warrant a Magliner-type cart. Essentially, this cart would only need to support the gear one might typically find in an audio bag. It will, however, be more comfortable than wearing a harness all day. It should also be suitable for times when I have a seperate boom operator, but don't need a lot of equipment. I started with some steel shelving I got when a local store closed several years ago. I have lots more of the actual shelf parts than I do uprights to support them, so I'm sure I won't miss this one. It gives me a nice starting point since it's been stamped with the sides turned down to add strength. The shelf is actually much larger than I'd like so I've drawn lines on it where I plan to cut off each end, making two shelves with turned down sides on all but the back. I cut the ends off with a Dremel tool. 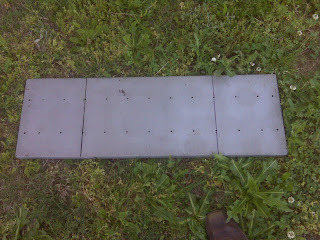 The steel turned out to be a good bit thicker than I expected, and I had to go buy some heavy-duty cutoff wheels to cut it. 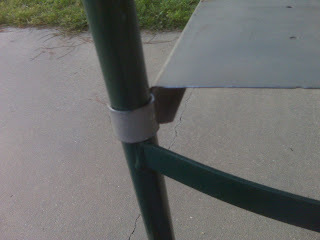 You can see from the picture, I left "tabs" on each side to attach the shelves to the cart itself. Originally, I planned to drill a hole in each tab and bolt it to the cart, but I worried that wouldn't be sturdy enough to keep the shelf from drooping. The main structure of the cart will be a standard hand truck. It's narrow enough to easily fit through doors and light enough be taken up stairs by only one person. I chose to bend the tabs on the shelves around the uprights on the hand truck. 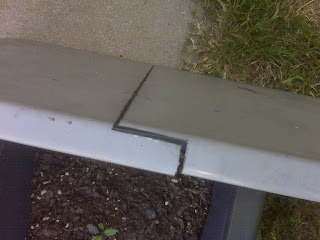 I roughed out the shape by bending the steel by hand with a large pair of pliers. Then I put the shelves in place and hammered each side snug. I hope this will make the shelves more stable when they are permanently attached. As of right now, they slide up and down, but don't droop (much). This is my first rough fitting. The shelves will be welded to the frame, and depending on how sturdy they are, I may add a diagonal brace under each one. 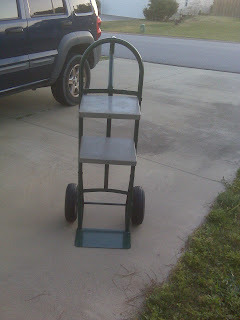 After that will come a coating of enamel so it hopefully looks better than your average hand-truck-with-shelves-welded-on. I also plan to add some sort of foam or rubber to the surface of each shelf to dampen vibrations and keep equipment from slipping off easily. Stay tuned for updates as this project progresses.